To Cite: Chehelcheraghi F, Eimani H, Homayoonsadraie S, Torkaman G, Amini A, et al. Effects of Acellular Amniotic Membrane Matrix and Bone Marrow-Derived Mesenchymal Stem Cells in Improving Random Skin Flap Survival in Rats, Iran Red Crescent Med J. 2016 ; 18(6):e25588. doi: 10.5812/ircmj.25588. Background: The necrotic skin flap represents a great challenge in plastic and reconstructive surgery. 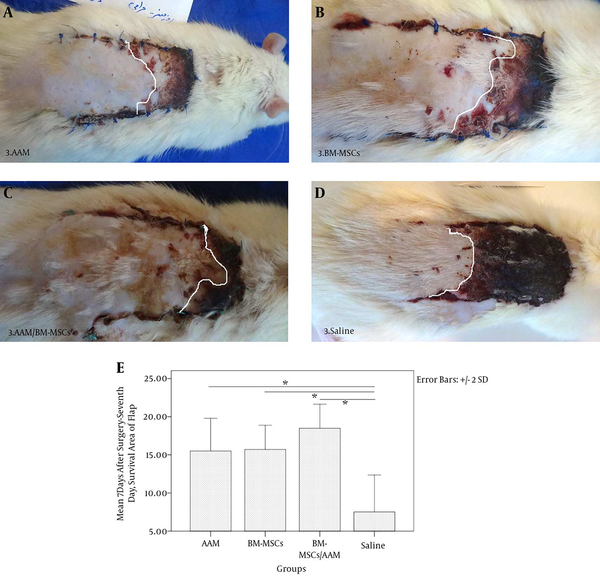 In this study, we evaluated the effect of bioscaffolds, acellular amniotic membranes (AAMs), and bone marrow-derived mesenchymal stem cells (BM-MSCs) on random skin flap (RSF) survival in rats by applying a cell-free extracellular matrix scaffold as a supportive component for the growth and proliferation of BM-MSCs on RSFs. AAM matrix scaffolds were created by incubating AMs in ethylenediaminetetraacetic acid 0.05% at 37°C, and cell scrapers were used. Objectives: The aim of the present study was to assess the effect of AAM as a scaffold in TE, and combined with transplanted BM-MSCs, on the survival of RSFs and on the biomechanical parameters of the incision-wound flap margins 7 days after flap elevation. Materials and Methods: BM-MSCs and AAMs were transplanted into subcutaneous tissue in the flap area. On the 7th postoperative day, the surviving flap areas were measured using digital imaging software, and the flap tissue was collected for evaluation. Forty rats were randomly divided into four groups of 10 each: group 1 received an AAM injection; group 2 underwent BM-MSC transplantation; group 3 received both AAM injection + BM-MSC transplantation; and group 4 was the control group, receiving only saline. Results: The survival area in the AAM/BM-MSC group was significantly higher than in the control group (18.49 ± 1.58 versus 7.51 ± 2.42, P < 0.05). The biomechanical assessment showed no significant differences between the experimental groups and the control group (P > 0.05), and there was no correlation with flap survival. Conclusions: Our findings showed that the treatment of flaps with BM-MSC and AAM transplantations significantly promoted flap survival compared to a control group. The viability of the flap was improved by combining BM-MSCs with AAM matrix scaffolds. Random skin flaps (RSFs) are widely used as a reconstructive option in plastic surgery (1) for the repair of defects resulting from trauma, congenital disorders, cancer, excisions, and other causes (2) However, the length-to-width ratio cannot currently exceed 1.5 - 2 for the clinical application of RSFs (3) Complete or incomplete ischemia of the skin flap is a widespread postsurgical problem (4). The basic causes of necrosis are arterial inflow, lack of venous outflow, or both. In marked cases, the most distal portion of the skin flap becomes necrotic if arterial or venous flow is insufficient (4). Numerous experiments have been conducted in an effort to improve skin flap survival; many of these have used pharmacological actions (sympatholytics, vasodilators, and calcium channel blockers), and have shown contrasting results (5). Neovascularization of the skin flap is a complicated process that requires proliferation of endothelial cells and cooperation of various growth factors (6). With this in mind, cell therapy has been considered an important basis of treatment, due to the cells’ capacity to self-renew and differentiate into numerous specific cell lines, and the use of mesenchymal cells derived from bone marrow and soft-tissue reconstruction has increased dramatically (7). Adult mesenchymal stem cells (MSCs) have the capacity for self-renewal and for differentiation into a variety of cells and tissues. 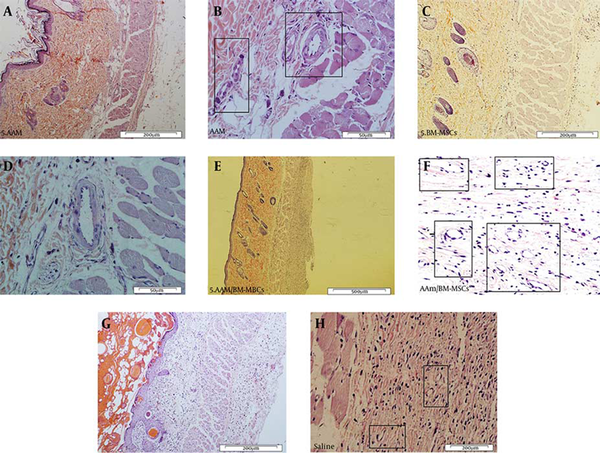 Allogenic and autologous MSC transplantation in the depths of burn wounds reduces inflammation and increases angiogenesis and granulation tissue (8). The healing process after autologous stem cell transplantation reaches its highest level, and in deep wound-healing, the transplanted cells can survive (9). These cells produce bioactive substances that appear to accelerate the regeneration process after a wound (10). Recently, great interest has been generated with regard to types of stem cell therapy that could be used to improve skin flap survival (5). It has been demonstrated that transplantation of MSCs contributes to reducing ischemia in ischemic vascular diseases through angiogenesis (11, 12). With the recent developments in tissue engineering (TE), angiogenesis has been created in transplanted tissue. Numerous studies have reported successful regeneration of tissues for the repair of a variety of tissue defects, and for aesthetic restorations of the face and the body (2) This is promising, given that efforts toward the clinical implementation of TE therapies, such as skin substitutes, have previously been restricted due to the lack of blood vessel development (13). No tissue-engineered constructs with an inherent vasculature, such as a capillary bed ready to be connected to be the host’s vascular system, are currently available (14). Therefore, the design and selection of biomaterials for scaffolding is a critical step in TE (15), during which cell-seeding onto scaffolds is the first step in establishing a three-dimensional culture; this plays a crucial role in determining the progress of tissue formation (15). Successful cell-seeding of the scaffold depends on the type and source of the living cells, as well as on the extracellular matrix (ECM) components of the scaffold. It has been found that fetal membranes can effectively control burn wounds and can provide coverage for a variety of surgical wounds in impaired individuals. The amniotic membrane (AM) is important for reducing inflammation and scarring (15). ECM secretion of amniotic membrane due to changes in the microenvironment of the cell. Dynamic changes in the peripheral cells, key differentiation, proliferation and cell migration (20-26). The aim of the present study was to assess the effect of AAM as a scaffold in TE, and combined with transplanted BM-MSCs, on the survival of RSFs and on the biomechanical parameters of the incision-wound flap margins 7 days after flap elevation. A total of 70 male albino Wistar rats, acquired from the Pasteur institute, Tehran, Iran, were used. Of these, 40 adult rats weighing 280 - 300 g and 30 rats weighing up to 40 g were used for RSF creation and as cell donors, respectively. All animals were kept in appropriate cages, which were conventional and separately ventilated. A nutritionally adequate diet was provided for the rats, and lighting was maintained at below 25 lux within the cages during daytime hours. To enable operators in the rat rooms to perform visual tasks, regular light cycles of 12/12 hours of light/dark were employed, and the use of dimmers allowed the creation of twilight periods between the light and dark cycles. Animals were kept at room temperature (20 - 22°C, and 24 - 26°C during surgery), and a moisture content of 40% - 70% was maintained. A room ventilation rate of approximately 15 - 20 air changes per hour as needed was established. All of the experimental protocols followed the guidelines for the Care and Use of Laboratory Animals, and the study was approved by the medical ethics committee of the research council of Baqyiatallah University of Medical Sciences (protocol number; 10 February 2014, N#399). BM-MSCs were isolated and prepared on the basis of the protocol used by Azizi et al. (27) Briefly, the donor animals were sacrificed using high-dose ketamine (Sigma Aldrich, Germany), after which the femur and tibia were opened. Bone marrow was extracted with Dulbecco’s modified Eagle’s medium (DMEM) (Invitrogen, Germany). All procedures were performed under sterile conditions. The BM-MSCs used for transplantation were harvested and labeled with a molecular probe, red fluorescent dye carbocyanine 1, 1-dioctadecyl-1 conjugated to 3, 3, 30, 30-tetramethylindocarbocyanine perchlorate (CM Dil Molecular Probes, Invitrogen, Germany) at a ratio of 1:100, and suspended in 0.5 mL DMEM for transplantation. Prior to transplantation, BM-MSCs were incubated with CM-Dil at 37°C for 15 minutes, and centrifuged to remove excess Dil dye (5). Trypan blue (Sigma Aldrich, Germany) staining was used to discriminate between viable and non-viable cells. Cell samples were prepared and suspended in saline at a volume of 1:1 before use. We mixed 20 µL of 0.04% Trypan blue with 20 µL of cell suspension, and after pipetting thoroughly, 10 µL of solution was loaded onto a hemocytometer slide. The cells were then incubated for 1 - 2 minutes at room temperature, after which they were counted under the microscope in all four squares (1 × 1 mm) of the hemocytometer chambers, and the average number of cells per square was determined. The concentration was 109 cells/mL. A total of 0.5 cc of BM-MSCs and AAM, or a combination of these, was diluted in 0.5 cc of normal saline and subcutaneously injected into four points of the central axis of the flap, from proximal to distal in the flap area. Injections were performed in the same manner for the control group (28). Human AMs were obtained under sterile conditions from eight healthy women who underwent elective Cesarean sections at Baqyiatallah hospital in Tehran, Iran. They had all tested negative for human immunodeficiency virus, hepatitis B and C virus, and cytomegalovirus, and had uncomplicated pregnancies without preterm rupture of membranes or signs of infection, including no streptococcus B on vaginal smears or other abnormalities. The AM was washed three times with sterile phosphate buffered saline (PBS) containing 50 µg/mL of penicillin and 50 µg/mL of streptomycin, deprived of the spongy layer, and cut into 2.5 × 2.5 cm pieces. The epithelial cells were removed by incubation in ethylenediaminetetraacetic acid 0.05% (Invitrogen, Germany) at 37°C for 2 hours, then gently scraped with a cell scraper under a microscope. The complete removal of epithelial cells was confirmed using hematoxylin and eosin (H & E) (Sigma Aldrich, Germany) stainin (29, 30). The flaps were made on 40 adult male albino Wistar rats weighing 280 - 300 g. The rats were randomly divided into four groups of 10 each (due to the low number of samples that may be. However, similar studies by other researchers (1, 3, 5-7, 31, 32). In order to increase flap survival have done, this corresponds) as follows: group 1 received an AAM injection, group 2 underwent BM-MSC transplantation, group 3 received AAM injection + BM-MSC transplantation, and group 4 was the control group, receiving only saline. All surgical procedures, injections, and transplantations were performed under sterile conditions. All of the animals were anesthetized with an intraperitoneal injection of 50 mg/kg of ketamine hydrochloride, along with 5 mg/kg of diazepam. The skin of each rat was shaved, then cleansed with povidone iodine. RSFs were created, including the entire thickness of the skin and dermal muscle (panniculus carnosus). A distally-based flap between the iliac crests was created as a horizontal line. Each flap measured 30 × 80 mm. Immediately after lifting the flap, it was returned with interrupted sutures. 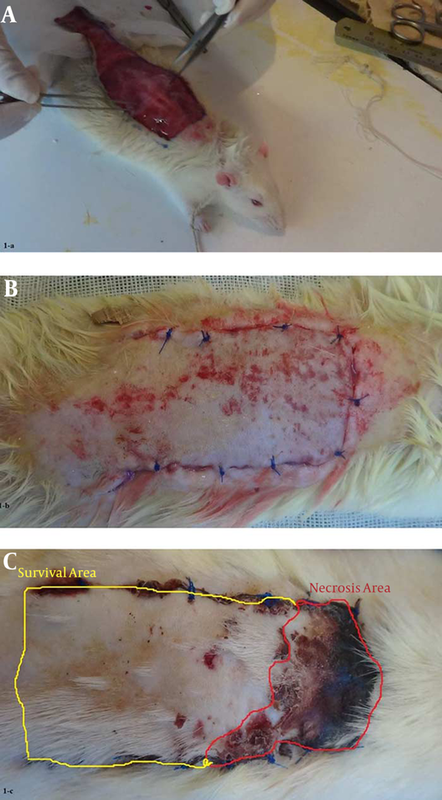 Seven days after flap elevation, the rats were sacrificed using chloroform inhalation in a closed space, and the surviving areas of the flaps were measured (Figure 1). A, each flap was 80 × 30 mm. One rectangular flap was drawn on the rat dorsum. On the surgery day (day 0), the AAM, BM-MSCs, AAM/BM-MSCs, and saline (control) injections and transplantations were done for each flap, which were then elevated as random pattern flaps; B, the flaps were immediately sutured; C, the flap survival area was measured 7 days after flap elevation. The flap areas were measured on day 0 after flap elevation. 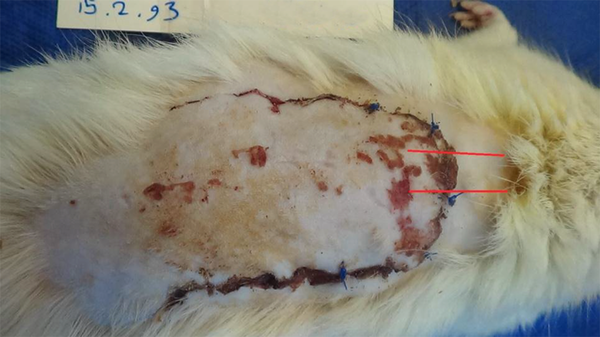 The total area of the skin flap was covered by soft and normal skin. Day 7 was chosen for the measurement of survival areas. The distal parts of the flaps were thick, with hard formations, due to ischemia. The flaps were photographed for digital images on days 0 and 7, and the total surface area of the flaps was traced, calculated, and analyzed using Adobe Photoshop CS6 extended software (Adobe Systems, Inc., San Jose, CA, USA). This surface area was compared between the studied groups on days 0 and 7 (4). The biomechanical flap properties of our samples were evaluated in a manner similar to that used in our previous study (1). Briefly, the rats were sacrificed on day 7 via inhalation of chloroform, after which samples were taken (each sample measuring 35 mm in length and 15 mm in width). The sampling location was the center of the distal part of the flap (Figure 2). The samples were immediately wrapped in sterile gauze soaked in saline, then stored at -20°C until the time of assessment. For the tensiometrical evaluation, the samples were thawed at room temperature, and the biomechanics were evaluated with a tensiometrical device (Zwickau/Roll, Z 2-5-PH1F, Germany). The edges of each specimen were fixed in the jaws of a mobile device, and information regarding the thickness and width of the sample was obtained with a digital caliper. The jaws of the machine moved at a speed of 20 mm per minute. A computer recorded the load-deformation curve for each sample. To evaluate the biomechanical properties, we measured ultimate tensile strength (UTS) (N), stiffness (N/mm), deformation at Fmax (mm), and absorbed energy up to Fmax (N. mm). All values were expressed as mean ± standard deviation. Normal distribution of data was analyzed using a one-sample Kolmogorov–Smirnov test. All data were analyzed using one-way analysis of variance (ANOVA) followed by a Tukey test, using IBM SPSS version 22. A P value of < 0.05 was considered statistically significant. A linear regression analysis was used to test for correlations between flap survival and biomechanical flap properties (UTS, stiffness, deformation at Fmax and absorbed energy up to Fmax). All of the rats tolerated the treatment and skin flap procedures without any complications, and did not show any signs of swelling and/or exudation or total necrosis at the surgical site during the experimental period. The flaps showed congestion at the distal end on day 7 after flap elevation. A demarcation line between the surviving and necrotic areas was clearly observed on day 7. The survival area of the flaps appeared pink and normal in texture, whereas the necrotic areas were dark brown and rigid. No bleeding was observed when the survival area was cut with a scalpel (Figure 3). A, AAM; B, BM-MSCs; C, AAM/BM-MSCs; D, Saline; E, mean ± SD of the survival area on day 7 of RSFs relative to total area at day 0. Analysis of variance was conducted for all of the studied groups (left to right and above chart). *Statistically significant differences in the survival areas on day 7 (P < 0.05). Analysis of variance was conducted for all of the studied groups and showed no significant differences in flap size on day 0 (P > 0.05). On day 7 post-surgery, CM-Dil-labeled BM-MSC cells were still found in the subcutaneous tissue of the flaps. A quantity of the transplanted BM-MSC cells were observed close to blood vessels on fluorescent slices (Figures 5 and 6). Histological examination revealed that the decellularization process was successful, and no epithelial cells were visible on the basement membrane side of the prepared AMs (Figure 7). A and B, H & E staining of the AAM; C and D, BM-MSC, E and F, AAM/BM-MSC; G and H, saline groups. Black rectangles indicate the formation of new or developing capillaries (200 × and 50 × magnification). A, evidence of Dil fluorescence of BM-MSC-treated flap tissue in areas with high nuclear density (Dil) tissue on the transplant areas 7 days after flap elevation; B, the same section, but a different area. Note the close position of BM-MSCs to microvessels in the skin flap tissue (magnification ×100). A, AM with epithelial cells; B, AAM (200 × magnification). The effect of ischemia resulting from RSFs on biomechanical properties 7 days after flap elevation is shown in Figure 8. UTS up to Fmax, stiffness, and deformities were higher in the AAM/BM-MSC group than in the other groups (Figure 8). However, there were no significant differences between the studied groups (P = 1.000). A, Curve of load deformation. The linear portion of the curve represents the assessment of the relative stiffness; B, at the highest point of the curve, UTS is observed. The maximum point of the curve was deemed the UTS of the flaps; C, the UTS of the wounds on the flap margins of the control and experimental groups = 0.103. Deformation, stiffness, and work up to Fmax of the wounds on the flap margins of the control and experimental groups (P > 0.05). The results of the one-way ANOVA and the post hoc Tukey multiple comparisons test. For all determinations, the sample size was n = 10, and all values are represented as mean ± SD. The use of biological agents to aid in the formation of new blood vessels represents an exciting field of research. Recently, considerable interest has been shown in this innovative approach to treating tissue ischemia for clinical goals (31). The aim of the present study was to investigate the effects of AAMs and BM-MSCs on RSF survival and their biomechanical parameters in rats. This research was informed by several recent studies in skin wound repair that used bioscaffolds and stem cells for reconstruction of large soft tissue defects (8, 32-37). We chose a treatment protocol using AAM alone or AAM + BM-MSCs on day 0, and this treatment schedule was well tolerated in the rats we used. Since AAMs and BM-MSCs do not have their own unique mechanisms of action, we applied both of these in one experimental group (11, 29, 38-40). We hypothesized that their combined effect could increase the survival area of the RSF. The results obtained on the 7th postoperative day indicated an enhancement of skin flap survival in the experimental groups, especially in the AAM/BM-MSC group. However, the biomechanical properties of the tissues and increased survival of the flaps were observed for only one factor (ultimate tensile strength) in this correlation, which is similar to the results of previous studies (1). The pharmacological manipulation caused surgical delay, and, additionally, by increasing skin blood flow, it improved skin flap survival. In our previous study, we reported that pentoxifylline is preferable for the treatment of RSFs. The application of this drug is effective at improving tissue levels without producing significant side effects (1). Optimum healing of a cutaneous wound requires a well-orchestrated integration of the complex biological and molecular events that occur during cell migration and proliferation, as well as ECM deposition and remodeling in the regenerated tissue (11). MSCs are involved in a variety of surgical wounds, such as vascular, diabetes, and chronic ulcers at wound healing processes is a vital point (8). MSCs play a role in the three phases of wound-healing (inflammation, proliferation, and recovery), and with their protective effects, they facilitate the healing process (8). In this regard, Sheng et al. (2011) demonstrated that BM-MSC transplantation improves neovascularization by increasing capillary angiogenesis and blood flow perfusion (6). They showed that BM-MSCs, a heterogeneous population of cells, are more beneficial than homogenous compositions in therapeutic vascularization (6). 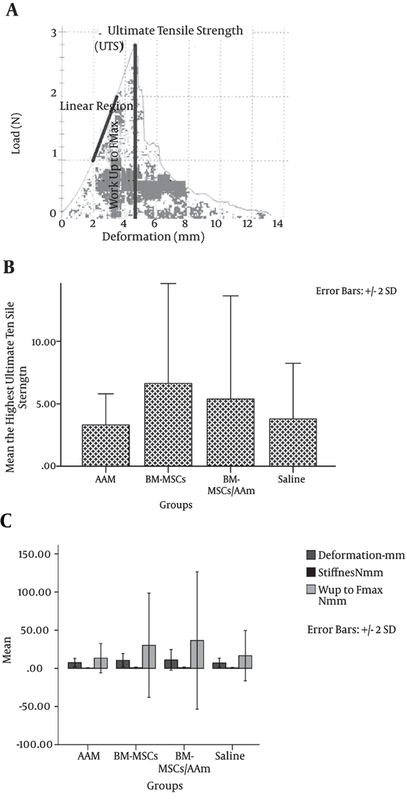 The effects of BM-MSCs and adipose mesenchymal stem cells (AD-MSCs) on skin flap survival have often been studied in dorsal random skin flaps in rats (5). In the majority of these studies, the length and area of necrotic tissue significantly decreased as a result of treatment with stem cells (3, 5-7, 33). Natural biological scaffolding cells are preferred for better performance (13). Biological scaffolds have potentially beneficial effects in the fields of TE and regenerative medicine (13), and various biomaterials have been used as dermal matrix substitutes (13). However, the search to find an ideal matrix that is inexpensive, supports mesenchymal cell in-growth, improves epidermal cell adherence and proliferation, and has minimal toxicity and low immunogenicity, as well as good mechanical properties, has continued (29). In addition, the major challenge in TE is the design and fabrication of a biodegradable scaffold with a surface suited to cell attachment, proliferation, and differentiation, and that can assist in the tissue-formation process (13, 15). Wound-healing has been successfully achieved by implantation or treatment with many different scaffolds in skin TE (8, 31, 32, 34-37). One of the oldest biomaterials used for scaffolds is fetal membrane, which was first used for the transplantation of skin (15). Another notable advantage of the use of AM for tissue repair, in addition to its specific components, is that there is no cost, as the AM is often discarded with the placenta after parturiency Which is available to a large number of ethical issues in a bit (36). In 2007, Portman-Lenzetal presented an acellular amnion scaffold, which was useful in a variety of other therapeutic tissue-regeneration approaches. These scaffolds may be applied alone or in combination with allogeneic amnion cells (30). Human AM transplants have been successfully applied in the treatment of various diseases, including ocular surface disorders, thermal burns, chronic skin wounds, and immunology-based rejections after transplantation (41-43). The AM has numerous characteristics that make it potentially suitable for use in TE (15). It has therefore been widely applied, and has been combined with cell cultures or growth factors for use as a carrier to repair skin defects (44, 45). In a similar manner, it has been reported that the microstructural aspects of scaffolds, such as surface properties, pore size, porosity, and connectivity of pores, are different (46, 47). This type of scaffold shows superior performance in the construction of tissue-engineered skin (46, 47). With regard to TE, these vascular beds are a microcosm of the circulatory system and can serve as a bioscaffold to create autologous vascularized constructs in vitro (34). Previous studies have revealed that the proliferation and differentiation to AD-MSCs in scaffold cultures are significantly higher than in other cultures (29, 48). 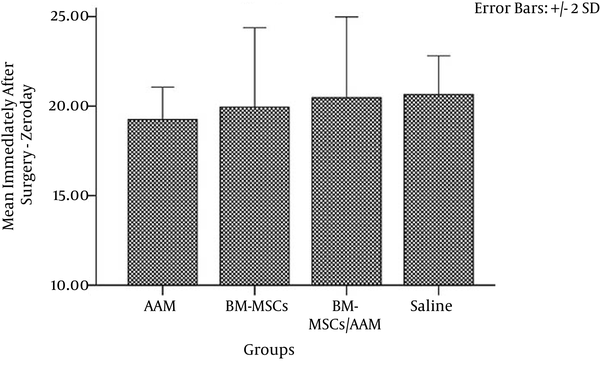 The survival areas of RSFs in the AAM and AAM/BM-MSCs groups in the present study were higher than in the other groups. Nevertheless, there were no significant differences in biomechanical parameters between the studied groups. This was confirmed by the fact that the extent of surface necrosis did not correlate with the biomechanical parameters of the test wound (49, 50). Therefore, we suggest considering different times for biomechanical testing. We will attempt to demonstrate the known effects of AAM/BM-MSCs on the neovascularization of skin flaps and the mechanisms involved in wound-healing in further studies. We will investigate the effects of aligned or random collagens in the tissues of engineered flaps treated with AAM/BM-MSCs amid an increase in BM-MSC proliferation, adhesion, and interaction. In addition, we will attempt to reveal the ultrastructural features of hypoxia in the blood vessel endothelium of the surviving parts of the RSFs, such as the mitochondria, cell membrane, and nuclear envelope, and we will compare the findings with the results of previous studies. In conclusion, the treatment of RSFs with BM-MSCs and bioscaffold AAM significantly increased the survival rate of the flap areas. Furthermore, we showed that local application of BM-MSCs in combination with bioscaffold AAM was more effective than AAM alone or saline. A potential mechanism for the AAM is that it acts like the ECM. The basement membrane components of the AM are used for the overlying cell growth and play a large role in cell adhesion during the cell-seeding protocol. We wish to thank the vice chancellor of research at Baqyiatallah University, M.S., for financial support. We thank Dr. Assadi for technical support. Funding/Support: This work was supported by a grant (N#399, 10 February 2014) from the Medical Faculty, Baqyiatallah University of Medical Sciences, Tehran, Iran.